​Cooking Time: 45 minutes. Difficulty: Low. Requires: flan moulds. Put the cream into a saucepan. Dissolve the cornstarch in 1 tbsp water and add it to the cream, stirring carefully. Add a little salt, freshly ground pepper and a touch of nutmeg. Place the saucepan on the stove and bring to a boil. In the meantime, whisk the eggs together with the grated Parmigiano Reggiano. Once the cream has reached a boil, remove it from heat and add a little bit of the beaten eggs. Stir quickly to bring the eggs up to temperature. Slowly add the remaining cream, stirring carefully. When the mixture is ready, grease the flan molds with butter or nonstick spray. Then spoon the flan mixture into the molds, leaving ½ inch of space at the top. Place the molds in a high-sided baking dish that can be used as a bain marie: add cold water - to about 1/2 way up the flan moulds - being careful not to let the flans get wet - and bake in a 150° C oven for 20 minutes. 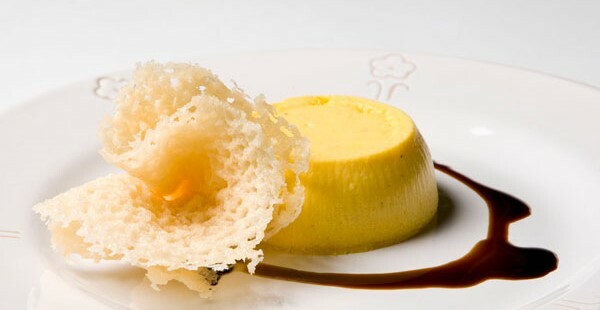 While the flan is cooking, prepare the crispy Parmigiano Reggiano wafers. Then remove the cheese crisp from the parchment paper, being careful not to burn yourself with the cheese because it is very hot. Wait a few moments, then shape the wafer as you like. Try pinching it in the center to make a flower. When the flans are done cooking, let them cool for 5 minutes, or until firm. Remove them from the molds and plate them: serve with a couple dashes of balsamic glaze and a Parmigiano Reggiano wafer.